Ivan Ivanovich Shishkin is a great Russian artist, who gained fame for himself with paintings depicting his native nature. Especially inspired Shishkin forest. In the artist’s paintings, he is different – coniferous and mixed, summer and winter – but always traced with surprising authenticity, accuracy and love. “Children in the Forest” – one of these paintings, characteristic of the work of Shishkin. It is enough to cast a fleeting glance at the canvas in order to determine the author by the manner of execution and the plot. Almost the entire space of the picture is occupied by images of grass and trees. In the foreground we see a lawn, slightly yellowed from the summer heat, with touching dandelion heads. On both sides there are powerful tree trunks: on the left are dark brown trunks of pine trees, and on the right is the light bark of Russian birch. Trees frame the picture, give it completeness, compositional completeness. Their straight trunks are directed upwards, and the crowns are lost outside the canvas. The background is also a solid green wall of trees and shrubs. Through the branches of trees one can see a piece of a pale blue sky, which is so characteristic of a summer day in central Russia. But such a sky does not leave the impression of cloudiness and cold. It is balanced by sun glare on the surface of the grass. Remarkably built perspective paintings. It can be seen how the edge, starting in the foreground, extends into the distance and leads us behind us, to the trees depicted in the background. In the center of the composition are two children’s figures, surprisingly small and defenseless in this green forest kingdom. The red clothing of one of the children stands out against the general background of the picture and involuntarily draws the eye to itself. Compared with him, the second child is almost imperceptible. 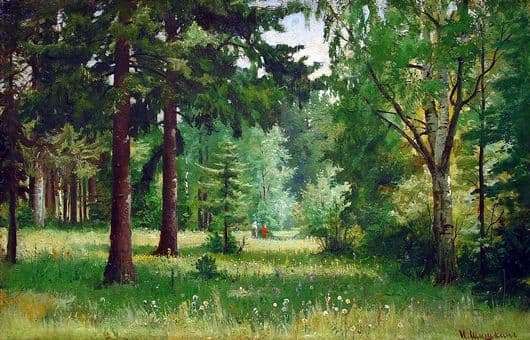 In the picture Shishkin uses different shades of green. Here we see both rich dark in the image of coniferous trees, and warm, almost yellow, in drawing the grass. Colors replace each other, creating amazing harmony and realism.